Along with wisdom, the Biblical King Solomon valued prudence – the ability to use skill and good judgment in managing affairs. “Doth not wisdom cry aloud, and wisdom put forth her voice?” (Proverbs 8:1) And prudence, coupled with wisdom, gave the King sovereignty over one of the most prosperous kingdoms of Biblical times. For investors, too, prudence along with knowledge leads to prosperous investing. One prudent action in real estate investing is to take out a mortgage when rates are low. Thanks in part to circumstances surrounding the housing collapse of 2008-2011, mortgage rates are at almost record lows – but fewer mortgage applications are being processed. The reasons for this decline spell bad news for many aspiring homeowners, but the current mortgage situation creates some positive conditions for investors following Jason Harman’s advice to buy income property on a long-term, fixed-rate mortgage. Because of intervention by the Federal Reserve, mortgage rates on a 30-year fixed rate mortgage of the type Jason Hartman recommends are currently hovering at around 3 per cent – one of the lowest rates ever. Yet, according to CNBC, many leading lenders report that fewer mortgage applications are being processed now than in previous years. The reasons are linked to the housing collapse of 2008-2011 as well as general economic conditions. The housing crisis led to massive foreclosures in markets all across the country, as many mortgage holders lost their homes. At that time, getting approval for a mortgage application was ridiculously easy, with almost no applicants turned away. These subprime borrowers quickly lost control of the mortgages – and eventually, the homes they were purchasing. That changed the landscape of mortgage lending. In today’s market, homeowners who manage to stay afloat and hang onto their properties have generally already refinanced their homes and are not seeking more financing options. Among those who don’t currently own homes, a large number are former homeowners who have no way to reenter the housing market. But because of the subprime mortgage debacle, lenders have established stricter eligibility standards. And many aspiring homeowners simply can’t meet those standards for a variety of reasons including low income, credit score problems and insufficient cash to make a down payment. Because so many people are locked out of homeownership, this creates a virtually permanent group of renters – as shown by the rising demand for rental housing and the upswing in rental rates in many major markets. And since fewer buyers are buying, numerous properties – including new waves of foreclosures – are still available for investors who can qualify for these low-rate mortgages. Fixed-rate mortgages reflect the national average but can vary from state to state. These mortgages operate on a fixed rate that doesn’t change over the course of the loan, allowing income property investors to cover the loan payments from tenant rents. 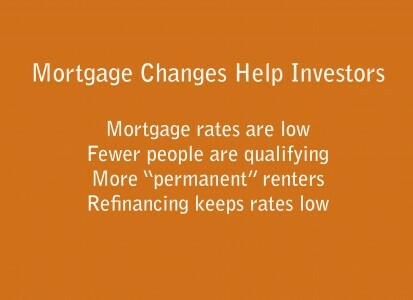 And as interest rates chance, these mortgages can be refinanced for better terms. A key piece of Jason Harman’s advice is, “Refi till you die” – allowing investors to take advantage of mortgage conditions throughout the life of their investment. With less competition and more available properties, current conditions mean new opportunities for prudent income property investors.